Fun Fact Tape Measure: 10-foot tape measure decorated with fascinating figures. 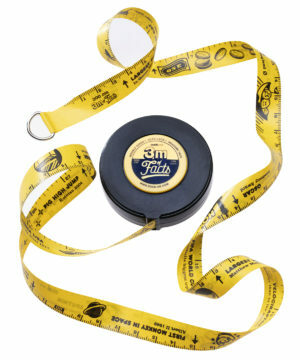 The Fun Fact Tape Measure is made to measure and entertain with fascinating facts accompanying the standard measurements listed on the tape. This flexible vinyl reel lists real measurements of both famous and lesser-known objects and people along three meters of marked tape. So whether you're marking 30 3/8" of space for the Mona Lisa on your living room wall or tailoring a 53 cm high space suit for the first monkey to leave Earth's atmosphere, you've finally got the tools to get the job done. Most importantly, you’ll be entertained while you do your real projects (which is one thing that can’t be measured).